Those 1972 Miami Dolphins players who are waiting to break out the champagne as they always do when a team gets deep into an NFL season unbeaten but finally suffers a loss may have their last, best chance to sip the bubbly this Sunday when the desperate New York Giants host the unbeaten Green Bay Packers in realistically the Pack’s biggest test remaining on the regular-season NFL schedule. Following this game, the Packers finish with three of four at home (Oakland, Chicago likely without Jay Cutler, and Detroit). The road game is at Kansas City. So it sure looks like Aaron Rodgers and Co. are going to become the third team to run the table in the regular season if they win this game. The Packers can officially clinch the NFC North with a win and a Lions' loss to the Saints on Sunday night. But it’s always dangerous to face a desperate club at home, and that’s what New York (6-5) is following Monday night’s embarrassing 49-24 destruction in New Orleans. The Giants comfortably led the NFC East less than a month ago, but following three straight losses they are now a game behind Dallas – and the Cowboys figure to win this week at Arizona. New York and Dallas do play twice yet this year, including next Sunday night. Tom Coughlin’s Giants coaching career likely will be on the line in the season’s final five weeks. Remember the last time the Packers and Giants played? It came at Lambeau Field in Week 16 last season. The Packers’ playoff hopes were on the line after suffering back-to-back losses when Rodgers had been knocked out of a Week 14 game against Detroit with a concussion and then missed Week 15. All Rodgers did in returning against the G-Men was throw for 404 yards and four touchdowns in a 45-17 blowout, and he has been playing at a Hall of Fame-level since. That also started Green Bay’s current 17-game winning streak. The Giants, meanwhile, would miss the playoffs largely due to that loss. New York had six turnovers in the defeat, including four Eli Manning picks. Unfortunately for New York some key players are very much in question this week. Defensive end Osi Umenyiora, second on the team in sacks, is expected out after leaving Monday’s loss with an ankle injury. This isn’t good news considering the Giants have had just one sack in their past two games and none on Monday night, the first time since Nov. 14, 2010, vs. Dallas that New York was sackless. Second-leading tackler and linebacker Michael Boley missed a second straight game Monday and is in question with a hamstring injury. New York’s No. 28 defense could be torched by Rodgers after allowing 577 yards to the Saints and five Drew Brees touchdowns (one rushing). Big Blue’s D gave up 15 plays of 15 yards or more and eight plays of 20 yards or more. RB Ahmad Bradshaw, WR Mario Manningham and left tackle Will Beatty all sat out Monday as well. Bradshaw and Manningham are ‘iffy’ while Beatty is out after eye surgery. New York’s offense needs all the help it can get to keep the ball and the clock running and thus ensure Rodgers stays on the sideline as long as possible. Unfortunately the Giants rank last in the NFL in rushing, and that unit has been much worse with Bradshaw out, so Manning may have to win the game by himself. He was about the only Giant to show up Monday, throwing for 406 yards (and that included several dropped passes) and two TDs in the loss. Green Bay ranks No. 31 in the NFL in passing yards per game, but that’s misleading as a chunk of yardage each game comes in garbage time when teams are trying to catch up. The Pack lead the NFL with 22 picks and Manning has thrown at least one in each of the past four games. Green Bay opened as a seven-point favorite with the total at 52 on NFL odds. The Pack are 8-3 ATS this season and 4-2 ATS on road. New York is 4-6-1 ATS and 1-3-1 at home. ‘Over/under’ records: GB 7-4, NYG 6-4-1. 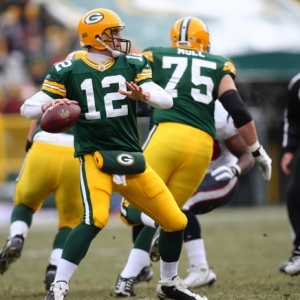 The Packers are 6-0 ATS in past six vs. teams with a winning record. They are 4-1 ATS in past five as a road favorite. The Giants are 8-3 ATS in past 11 as a home dog between 3.5-10 points. The G-Men are 1-6-1 ATS in past eight vs. teams with a winning record. The ‘under’ is 9-3 ATS in Pack’s past 12 as a road favorite. The ‘over’ is 4-0 in Giants’ past four as a home favorite. Road team has covered in five of past six in this series. The Giants franchise has had some good fortune against unbeaten teams. Of course, New York upended the 18-0 Patriots in the Super Bowl following the 2007 season (after almost beating the Pats in the regular-season finale). The franchise also ended a 13-0 start by Denver in 1998. Green Bay is one victory shy of tying the second-longest winning streak in NFL history behind the 2003-04 Patriots (21 games). The Packers’ nine-game winning streak away from Lambeau Field ties a franchise record. All the Giants are saying the right things, that this is a “playoff” game, etc., and that they will treat it like one effort-wise. They must get pressure on Rodgers and force at least a few turnovers. New York didn’t have a takeaway against New Orleans, either – the G-Men had gotten at least one takeaway in each of their last 23 games -- an NFL-long streak. I made the mistake of picking against Green Bay on Thanksgiving in Detroit, although I would argue the Lions mostly dominated the first half but kept screwing up. And with the Pack having extra rest and the Giants on a short week, that doesn’t bode well. Not to be wishy-washy here, but at seven points or less on the spread, I take the Packers. At 7.5 or more, if it gets there, I’m going with New York. I do like the ‘over’ as well as the weather shouldn’t be a factor. Allen Eastman is on a roll for his NFL picks. His incredible 411 System, the top NFL betting system in the nation, is on a 5-1-1 run the last few weeks and it is 81-47-4 the last four years overall. He will have a 7-Unit Game of the Year on his weekend card this week and a one-week package is only $99. Also, check his Insider’s Page HERE for free sports picks daily.